Trips with pets to San Francisco are great fun, as the city and surrounding area are packed with pet friendly attractions. The city of San Francisco is an ideal weekend-getaway destination for pet owners that want their four-legged friends with them every step of the way. There are many pet friendly hotels in the city that welcome pets with open paws. 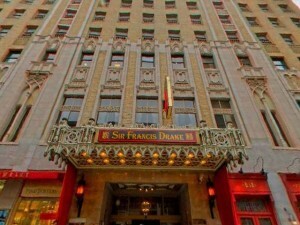 The Sir Francis Drake is a Kimpton Hotel in San Francisco where pets stay free. It has a VIP pet package. Vacation Pet Friendly rates Kimpton Group as one of the most pet friendly hotel chains in the U.S. Amenities in this pet package include pet massage, dog walking and tasty treats. The Argonaut is another pet friendly hotel that pampers pets with posh beds, yummy treats and walking trails. It is hotels like these that make trips with pets to San Francisco a delight. Remember, booking early is essential when traveling with pets. See what’s available today so you get the best deals. Start your search for pet friendly hotels in San Francisco here. Then sit back and think of all the fun things you can do when you get there! With so many pet friendly attractions, planning the itinerary for trips with pets on a San Francisco weekend getaway is a breeze. 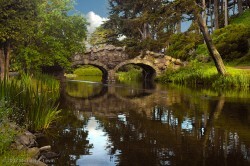 On Friday, pet owners can take a walk through Golden Gate Park. This is one of San Francisco’s most popular pet friendly parks. There are four separate off-leash areas in the park near the entrance at Fulton Street and 38th Avenue. The park also offers panoramic views of the Golden Gate Bridge and the cityscape. Saturday might be reserved for a day of cruising the bay’s waters. Blue and Gold Fleet Cruises allows leashed pets on its cruises. These cruises take a trip past the famous PIER 39 sea lions and along the city’s historic waterfront. As the boat sails under the Golden Gate Bridge, there are views of Alcatraz Island from every angle. Guides on the boat narrate the history of the city and famous inmates like Al Capone and Billy Cook. The cruise line also offers a scenic ferry ride to the city of Sausalito. This charming Mediterranean village is tucked in the hills of Marin County. Passengers and their pets can meander the narrow streets and window-shop the art galleries and chic shops. Sunday can be a day of basking in the sun and quite strolls along the talcum-powered beaches of San Francisco. At Ocean Beach dogs are allowed on the beach off-leash from stairwell 1 to stairwell 21. It is a fun beach for chasing seagulls and romping in the choppy waves. Baker Beach is another great spot for dogs. Dogs are permitted off-leash north of Lobos Creek. This beach also sports a stunning vista of the Golden Gate Bridge. 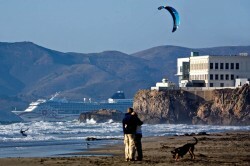 San Francisco is a great weekend vacation destination for both pets and their owners. The downtown streets are great for entertaining strolls past the high-end boutiques and historic landmarks. There is so much to see and do, that you may consider several getaway trips with pets to San Francisco and other nearby cities in the Bay Area. If you are considering making travel plans for trips with pets to San Francisco, start by checking out Vacation Pet Friendly’s many pet friendly hotels. You often will find not just lower prices, but also many pet perks with your hotel reservations. By presenting your rewards card at the front desk upon arrival your stay will be honored. Also, browse through our many listings of places to go and eat when in San Francisco. It’s all in our San Francisco Travel Guide. We always recommend booking early and travel prepared! Also, Vacation Pet Friendly is the expert at pet travel. If you have never traveled with pets before, please read our Pet Travel Checklist.